Emirates, the world’s largest international airline, has posted a record profit (its 28th consecutive year of profit) in its full year to 31 March 2016 as fuel costs fell and steady route expansion continued. With significant currency devaluations against the US dollar and fare adjustments following the reduction in fuel prices, Emirates revenue dropped 4% to USD 23.2 billion. East Asia and Australasia was the second-highest revenue earner for the airline, at USD 6.1 billion, a drop of 9% compared to the previous year. The Emirates group recorded a new record profit of USD 2.2 billion. It reported steady business growth in line with capacity increases and significant investment in the business at USD 4.7 billion. 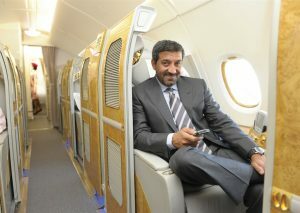 Emirates, the airline, made the highest profit ever with USD 1.9 billion. Chairman and chief executive, Emirates Airline and Group, His Highness Sheikh Ahmed bin Saeed Al Maktoum, said: “Emirates and dnata delivered record profits, solid business results, and continued to grow throughout 2015-16. “Against an unfavourable currency situation which eroded our revenues and profits, an uncertain global economic environment dogged by weak consumer and investor sentiment, as well as ongoing socio-political instability in many regions around the world, the group’s performance is testament to the success of our business model and strategies. “Looking at the year ahead, we expect that the low oil prices will continue to be a double-edged sword – a boon for our operating costs, but a bane for global business and consumer confidence. “The strong US dollar against major currencies will remain a challenge, as will the looming threat of protectionism in some countries. However, we enter the new financial year with confidence, backed by a robust balance sheet, solid track record, diverse global portfolio, and international talent pool. We will continue to evolve and grow our business profitably, and work even harder to meet and exceed our customers’ expectations,” Sheikh Ahmed said. Emirates’ total passenger and cargo capacity crossed the 56 billion mark, to 56.4 billion Available Tonne Kilometres (ATKMs), at the end of 2015-16, underscoring its position as the world’s largest international airline. The airline increased capacity during the year by 5.5 billion ATKMs, or 11% over 2014-15. Emirates received 29 new aircraft, its highest number during a financial year, including 16 A380s, 12 Boeing 777-300ERs and one Boeing 777F, bringing its total fleet count to 251 at the end of March. At the same time nine aircraft were phased out, taking the average fleet age down to 74 months or approximately half the industry average of 140 months. The airline remains the world’s largest operator of the Boeing 777 and A380 – both aircraft being amongst the most modern and efficient wide-bodied jets in the sky today. With the delivery of new aircraft, Emirates launched eight new passenger destinations: Bali, Bologna, Cebu, Clark, Istanbul (Sabiha Gökçen), Mashhad, Multan, Orlando; and two new additional freighter destinations: Columbus and Ciudad del Este. It also added services and capacity to 34 cities on its existing route network across Africa, Asia, Europe, the Middle East, and North America, offering customers even greater choice and connectivity.